Successfully Added Double Hamburger Mini Speaker to your Shopping Cart. 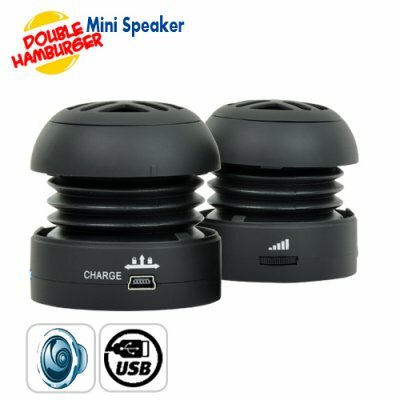 Cool new gadget - Double Hamburger Mini Speaker. Are you hungry for good audio? Are you starving for portability and delicious sound at the same time? Cure your hunger by getting this tasty Double Hamburger Mini Speaker. This Double Hamburger Mini Speaker is made of TWO Hamburger Mini Speakers, which are fresh off the grill and linked together to give you twice the fun. The speakers attach to each other thanks to the magnetic base, and can be extended upwards by giving it a side way twist. When packed together, it is no larger than a tennis ball, making it great for traveling and mobile uses. The "hamburger" shape is actually cutting-edge technology that endows this pint-sized speaker with beefy bass that makes other mini speakers drool. Your friends will be amazed to see that a speaker that fits in the palm of your hand can fill the room with big sound and full bass. With the Hamburger Mini Speaker, you can have portability AND great audio in one cool device. This combination of power and portability makes the Hamburger Speakers a great complement to small gadgets like your cellphone, iPhone, iPod, PSP, NDS, MP4 player, laptop, notebook, iPad, and portable CD player. The Hamburger Mini Speaker is great for sharing your tunes while relaxing outside, vacationing at the beach, driving in the car, hanging out with friends at school or at the mall, or even relaxing at home and in the office. Looking for a tasty item for resale? Hurry up and place your order right now before it runs out. Get a couple to enjoy with yourself and your family, or order in bulk to make a nice profit on your internet storefront. Whatever the reason is, you simply cannot go wrong with our 100% wholesale price and 24 hour express shipping service. Only available from the leader in wholesale electronics - Chinavasion. Compact travel speaker with big sounds!